Wilderness and forestry areas predominate in this corner of the state; only the sea corridor and dairy farms show signs of human habitation. 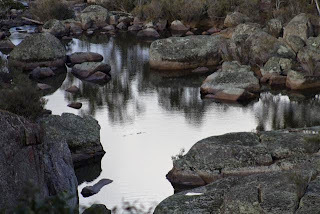 Two ancient river systems, the Tuross and the Towamba are remarkable in this area. 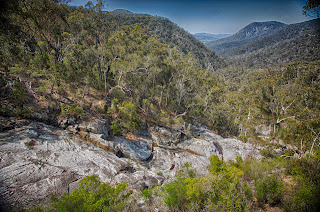 Myanba Gorge near the locality of Cathcart is a massive southern gorge connecting the ocean with the Alps. 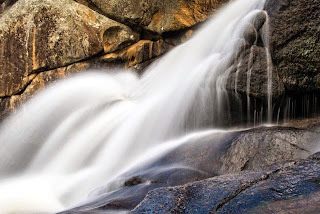 It hosts a zig-zag slot waterfall in the bedrock of an ancient river. 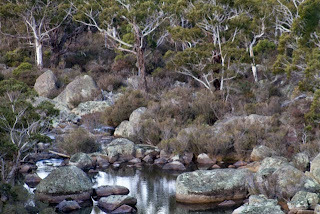 The blue granite bed of the ancient river perhaps once flowed the other way back towards the Alps. 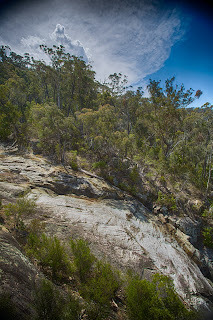 But Myanba Creek now cuts a steep path of multiple zig-zags through the Bones of the Earth to the Towamba River and the ocean. Like all who are young, it dallies along the way, sculpting strange shapes as it goes. 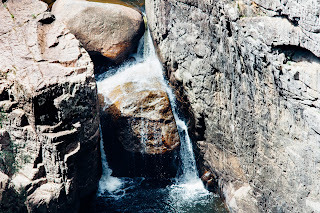 An old miner once called this feature near the top of the gorge the Fafnir Vatnfall, after the old northern dwarf prince who through greed turned into a dragon guarding a cursed gold horde ( a fickle gold field was once found near here). Certainly, there are plenty of local dragons here. Large (5+') monitor lizards still patrol the gorge. 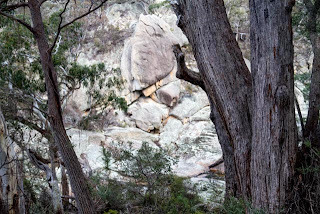 If you look too long you might see other things in the water sculptured granite: a koala, a heart, a kangaroo, a slippery dip or a fleck of gold dust. 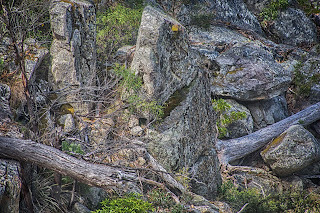 This is a different type of a portal - to pass this way up the gorge, you must first construct a bridge from a first shelf (background) to the portal with a fallen log, and then a second fallen log to a second shelf (foreground). If pursued, you can easily escape by knocking the bridge down as you pass. The portal walls are decorated with stone flake carvings of sea creatures, and both uprights have the shape of fresh water fish found in the streams. Stone or earth mound shaping is an often disregarded landscape feature - but it is a common element in the decoration or ceremonial usage of pinch points such as waterholes or waterfalls. My friend, Monique Helfrich, saw an old man here - some of the carving are in the eye of the beholder. 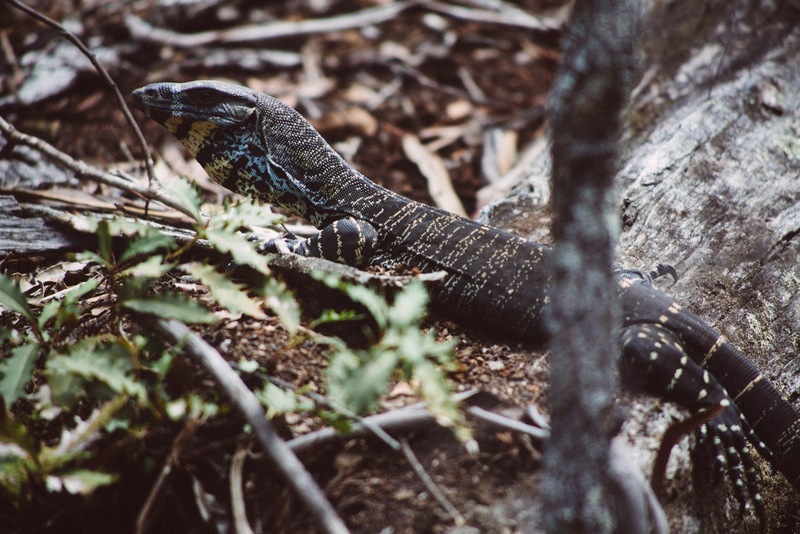 Watch for roos and goannas. In warm weather walk 'hard', to avoid meeting snakes (and keep careful watch for any that may be sleeping on paths. 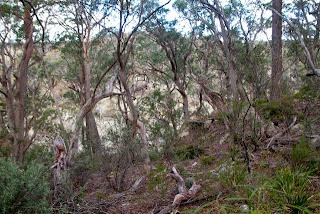 The top of Myanba Gorge is wheelchair accessible by a (old) wooden ramp that runs down a slight slope some distance. The Tuross River Falls is near the sunken forests of the Duea. It drops about 200m (600') and is one of the most remote falls safely accessible to bushwalkers. Tuross Falls in the Wadbilliga National Park is a large single leap fall coming from two chutes on the upper reaches of the Tuross River. 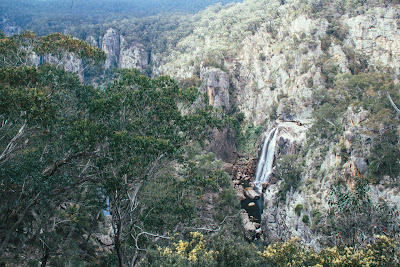 This river has many falls and cascades (from the falls lookout another 4 falls can be seen), but most of the river is inaccessible. 1. 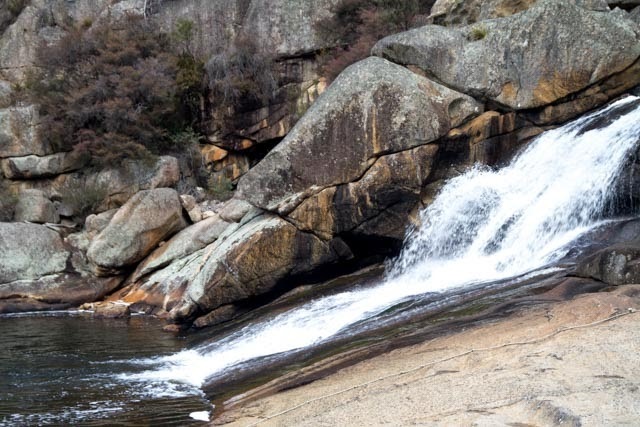 A giant once stole three girls swimming in a pool at the top of these falls. One of the girls called all the birds in the sky to help free them, and the birds came and threw the giant's head to the ground. The giant's head may still be seen at the foot of these falls. Look closely, and you will see the tears falling from his eye. 2. 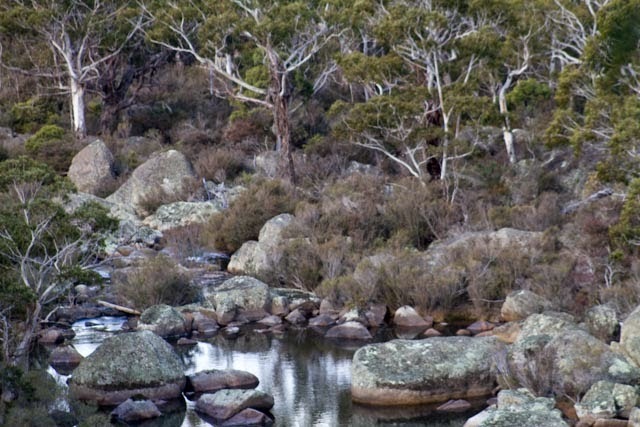 Dyillagamberra, the rain-maker, traveled up the Tuross River, digging holes and springs for the people. 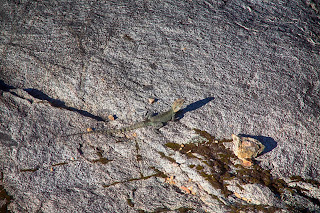 The waterholes are still here and in them, fish of all kinds. 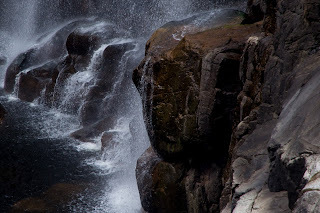 The waterholes of Tuross Falls are difficult to access - the cliffs are high and unforgiving. A good place for fish. These dream-time creation stories are different to those associated with other falls, such as Grove Creek Falls. Today, you can still see the head of the giant at the base of the falls. 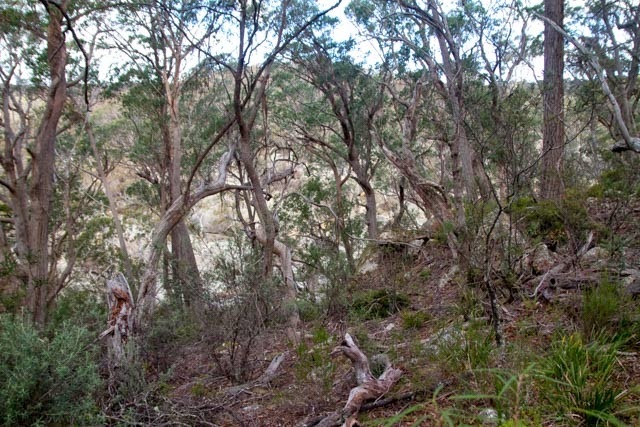 Regarding Dyillagamberra, geologists tell us that the coastal escarpments have been gradually eroding inland. 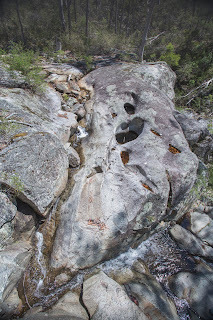 The rain made rivers have slowly cut great gorges, just like the Tuross Gorge. Over the eons, the cutting edges of the rivers, the high waterfalls, have gradually retreated up rivers, from the coast to the highlands. 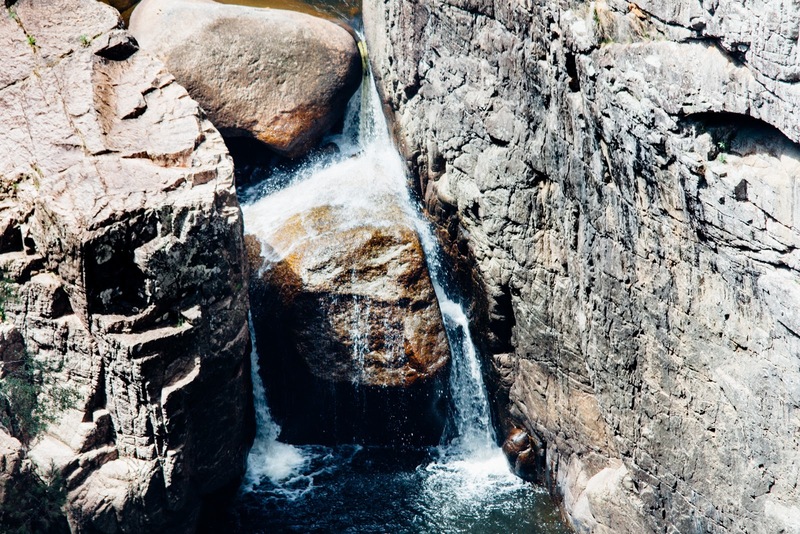 The waterfalls have left deep plunge pools, to remind us of where they once stood. 1. Access from the West. About 2hrs drive from Canberra to the Wadbilliga camping area (toilets and bbqs). 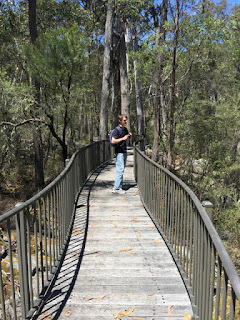 From here a 2.2km walk to the falls viewing platform (2.5hrs). 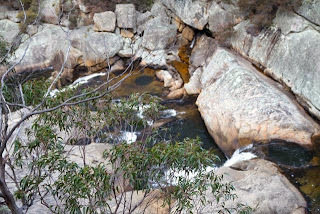 The base of the falls is inaccessible. The Wadbilliga Cascades is 15 minutes from the camping area and has a number of pools for swimming. 2. Access from the East. Some hikers have have suggested a second access path via the Bumberry Creek Fire Trail. I have not attempted that path which seems to end in the vicinity of the cliffs in the background of these images. This may be a very dangerous option. 3. 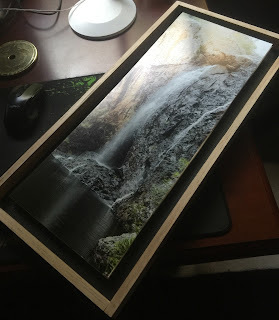 You will need a 200mm+ zoom for this waterfall with water reflection and ND filters to allow long exposure shots (like the first multi-shot photo in this series). 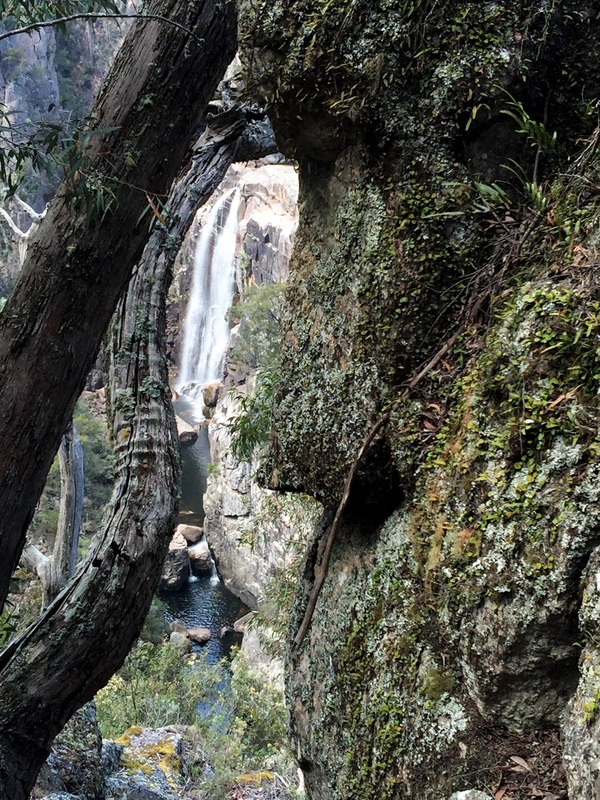 You will also get some decent shots of the massive cliffs behind the falls with a wide angle lens or a phone camera. 4. Resist the urge to scramble over the side. There is no safe way (without ropes and experience )to get to the base of the falls. 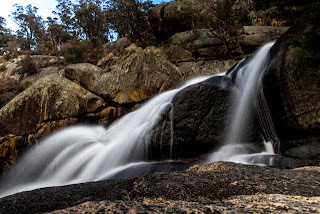 The Wadbilliga Cascades are a long stretch of waterfalls and cascades on the Tuross River. Some rivers get it easy. The Tuross River is not one of these. 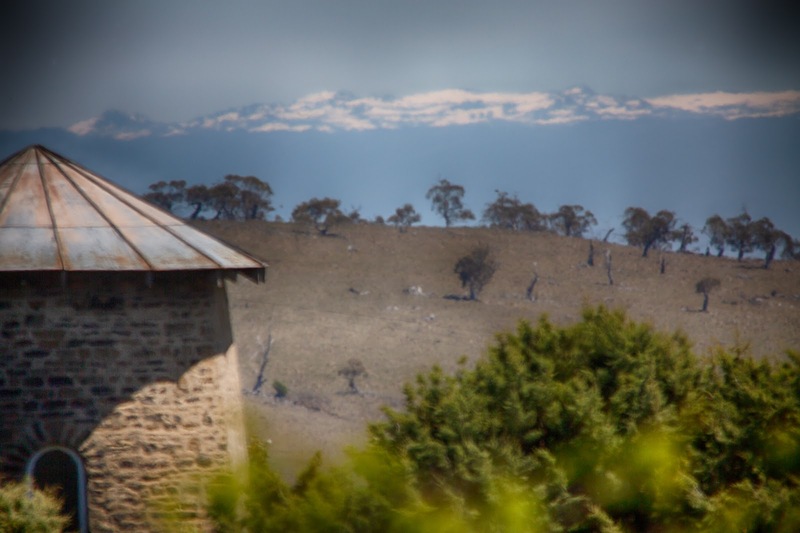 Rising in the mountains not far from Cooma, it cuts a tortuous path to the coast, through inaccessible wilderness and rugged gorges. 1. Most of the river is inaccessible. 2. The Wadbilliga Cascades is 15 minutes from the camping area and has a number of pools for swimming.